The Syrian revolution uses a strikingly familiar logo. 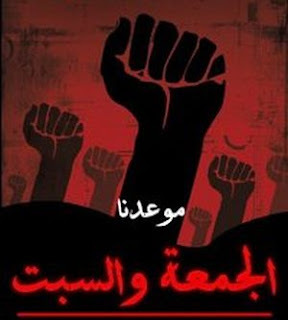 Egyptian youth movements- now the Syrian Youth Revolution. “A prominent Syrian opposition figure says the country is “a bomb, ready to explode” as protesters demand freedom and an end to president Bashar al-Assad’s “cancerous regime,”” reports Australia’s ABC News. This prominent Syrian opposition figure is “human rights activist” Haitham Maleh, of the Human Rights Association of Syria, recently released from a Syrian prison. Understanding who these “human rights activists” are, who is supporting them, and the role they play in the latest round of the Western-backed “Arab Spring,” we can better understand articles like Jerusalem Post’s ‘More than 100 killed in Syrian anti-government rallies.’ In the very first paragraph, the article concedes that the reports were cited from human rights activists and witnesses, thus a continuation of the absurd, unsubstantiated reporting seen earlier in Libya where unverified reports by the criminally irresponsible corporate media laid the groundwork for an equally criminal military intervention. Wesley Clark as slated for destabilization and regime change. poorly staged demonstration outside the Syrian Embassy in England. Be the first to comment on "Globalists Hit in Syria"